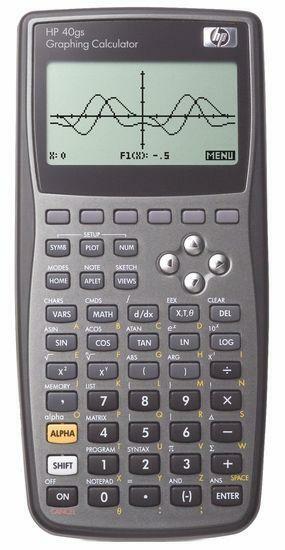 HP 40gs is the replacement model for the HP 40g Graphing Calculator. With CAS, HP 40gs can solve complex math, calculus, trigonometry and science problem visually. The HP 40gs Graphing Calculator is ideal for the activities and workload of students in the following courses: General Math, Pre-Algebra, Algebra, Trigonometry, Calculus, Statistics, Geometry, Biology, Chemistry, Physics, Earth Sciences and more. It allows you to create and store custom aplets with 256KB memory, easily share data and connect with PCs, and more. Plus, it comes with a slide-on hard cover for extra protection. Flash Rom (Calc BIOS can be updated). Tackle the toughest problems with 600+ built-in functions! Extra Built-in "Finance", "Linear Solver" and "Trianglur Solver" Aplets. Has a built-in library of 29 constants and easy metric unit conversions. New and improved "HP feel" keyboard. Symbolic, numeric, graphic views with dynamic split screen. Built-in CAS is ideal for activities and workload for students. With HP’s CAS, you get visual answers to advanced problems. New Dual Serial and USB Ports for data communication - see HP CONNX340GS. HP 40gs is built for performance! Easy to use, powerful HP Graphing Calculators are designed to perform above expectations for students and professionals on all levels. These reliable calculators are equipped with easy-to-use problem solving tools, flexible connectivity and customizing options, plus award-winning HP support. Note: The HP 40g has reached its product end-of-life (EOL). This product is no longer available for sale. Tagged By: HP 39gs - Activity Workbook, HP 39gs Aplet - Euler’s Method of Numerical Integration, HP 39gs Aplet - Sine and Cosine Rules, (a) Cost Estimation with Linear Regression, HP Calculator Connectivity Kit (CONNX3) for HP39gs or HP40gs, College Board AP, HP Solve. Where can this be purchased in the US, and at a reasonable price (is that a tall order?)? How does it compare with the less expensive Casio FX9860GII? The Casio compares to the Hp39G series and is more common and easier to find. The Hp40G is the Hp39G with CAS. CAS is NOT on the Casio 9860 calculator. CAS is a nice feature, but if it is not allowed, you will not be able to use in a classroom. Also the Hp 40G is very hard to find at the moment in the US. Walmart does not carry on its website and never carried retail. You might try Samson’s Cables. Hp is going to release an Hp Prime calculator in a few weeks that will surpass the features of the Hp40g series. It will also offer color. Both Hp and Casio tend to be less expensive than Ti. However, the Ti’s are well supported in the classroom, something to consider. If I were to choose between the Casio and the Hp40G, I would likely choose the Hp40G, but if I were to find a Casio 9850 slim, I would buy that (I have one). It is a pocket graphing calculator that has the screen layout as the other Casio’s. I don’t care for that, but the calculator is smaller. However, No CAS.